Guys, I’m feeling lazy on this Travel Tuesday eve. It seems a lot like a stay-in-pjs-all-day Saturday. Except for the whole being a grownup with a job thing. But I have something that’s long overdue to share with you. Well, a lot of things, but we’ll start with this one. 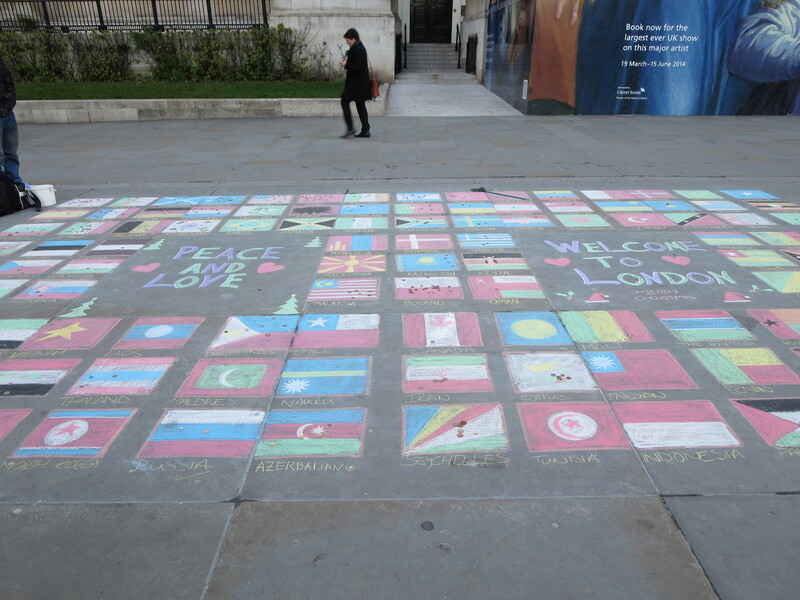 I’ve been putting off this post about my time in London’s Trafalgar Square, because I’ve been desperately searching for a photo that is over 20 years old and is an integral part of why I returned to Trafalgar Square! 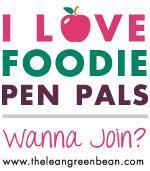 + a million other reasons + tasty recipes and adventures I’d wanted to share! The history goes a little something like this..
Back in the day, aunt goes all wanderlust on an adventure, winds up in London, meet a hilarious and charming Brit, marries said Brit, and continues living right outside London for the better part of two decades. So anyway, the picture I searched high and low for was taken at Trafalgar Square a million or so moons ago. Now flash forward to my NYC-London-Paris trip of late 2013-early 2014, when my parents and I had schemed together to exactly recreate the image we thought we had back at the house of me perched next to one of the absolutely massive lion statues. So, the week before Christmas 2013, I climbed up onto one of the lions and we recreated the photo..
Great picture, right? (Let’s just cool it with the crazy cat lady jokes, buddy.) However, look at the photo that was taken twenty-something years ago..
I’m pretty sure it’s a different lion (see the Canadian flag in the original? ), but this is definitely not the same picture in our minds! I do love how a) my dad has hair (love you dad!) b) that adorable and funny Brit is in the photo c) my mom looks like Joan Jett and d) I’m mid-blink with a sassy look on my face. I feel like this sums up our family, minus my adorable aunt, however. Hi Auntie Donna! 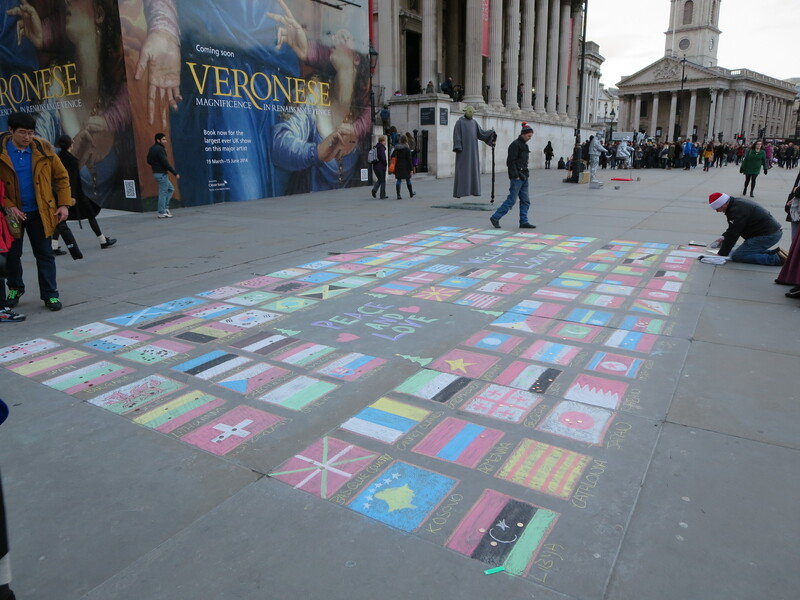 I caught the tail end of a very patient and wonderful man creating a piece of “sidewalk art” featuring the flags of all the world’s countries and welcoming me to London (how sweet of him!). 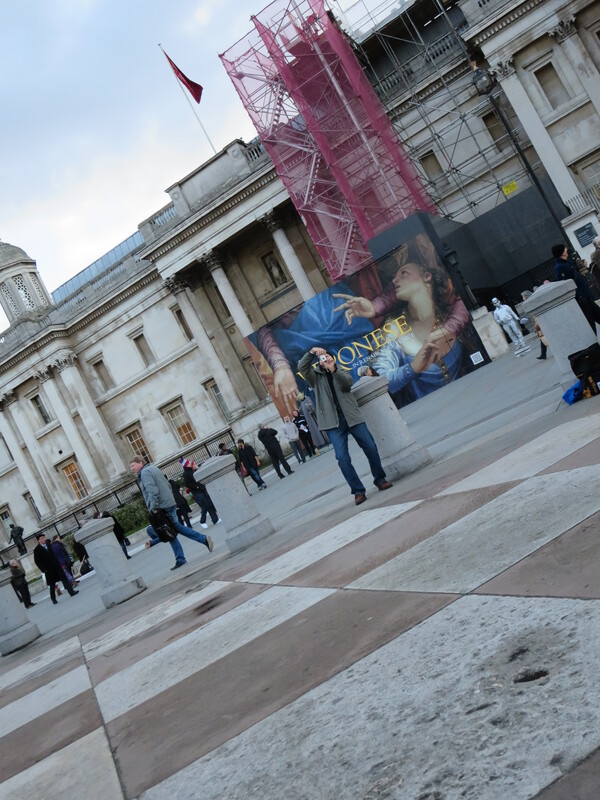 I saw street performers in front of the National Gallery. 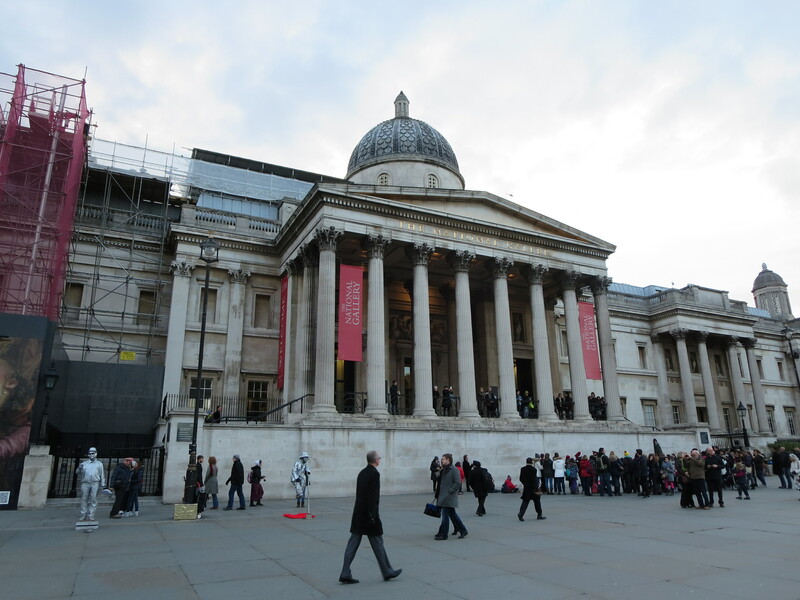 I’ve decided I must add the National Gallery onto my to-do list for my next trip! 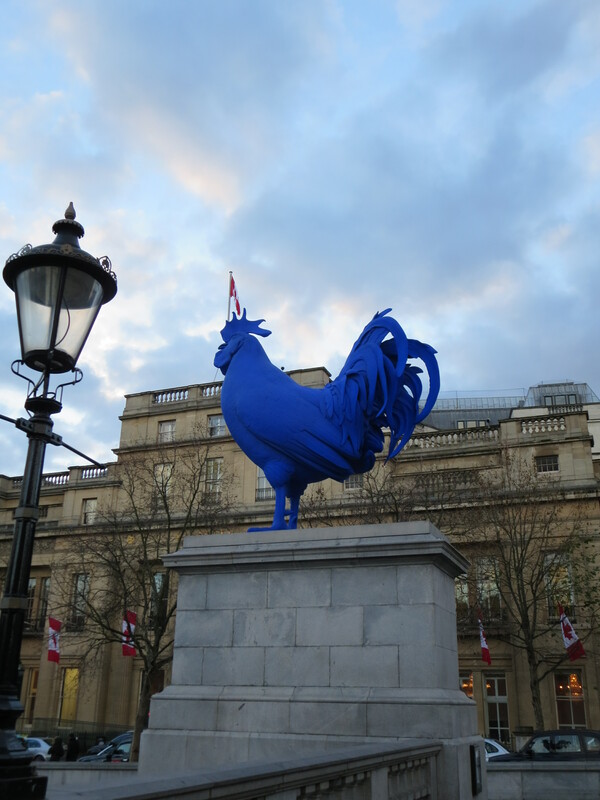 I made inappropriate jokes about the ginormous blue rooster pictured below. My dad was on a photo-taking binge, so I made sure to snap one of him snapping one of his family. And finally, I took in the hustle and bustle of this fabulous city. This photo is one of my favorites, as I feel it captures one of my now favorite cities in one, single shot. I can’t wait to find an excuse to head back to London and I will make sure it doesn’t take 20 YEARS for it to happen. I hear the romantic and the hubs of The Lazy Travelers are making their way there, so I hope they have a spot on their couch for me. I’d probably even be willing to trade them baked goods just to share the pug’s doggy bed. I wanted to note that I’d thought it was very coincidental that on the day I’d planned to post this, the always lovely Erin over at The World Wanderer mentioned how she was feeling some serious wanderlust about London on her Facebook page. 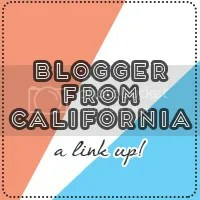 (You should go ‘like’ The World Wanderer on Facebook right. now.) 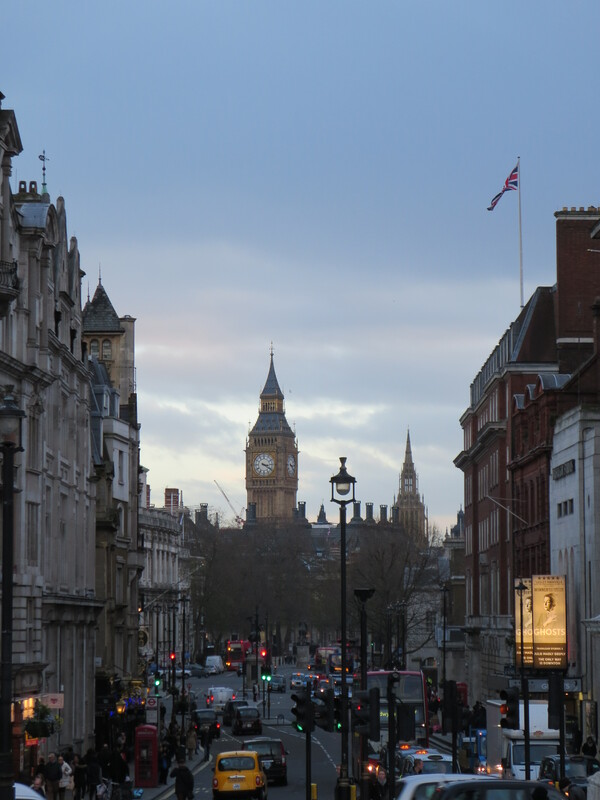 While I hadn’t connected the dots on my feelings about it before, I now recognize that I, too, am craving a trip back to London. So here’s to London, her people, her pomp and circumstance, her great food, long history, and amazing tourist attractions. Cheers! 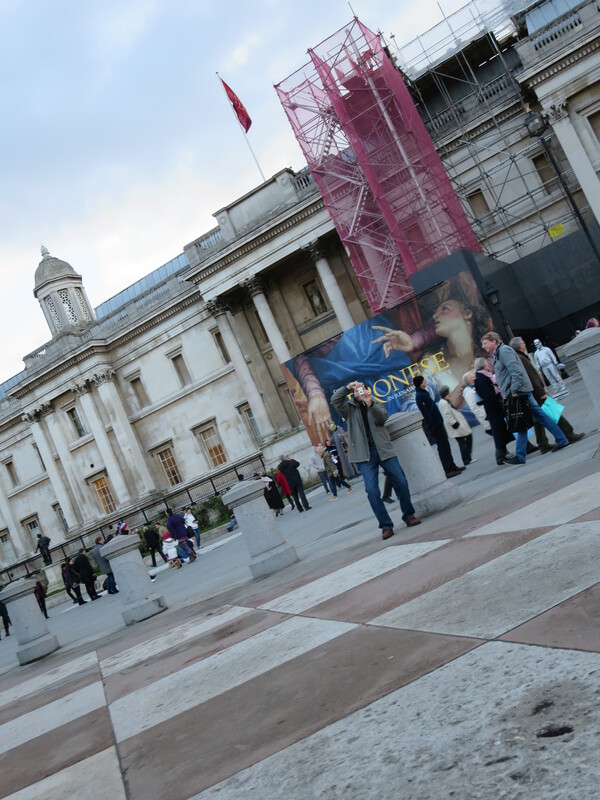 Posted in Travel Adventures and tagged England, London, Trafalgar Square, travel. Bookmark the permalink. Yes! Who doesn’t like wine and baked goods? This is sure to woo the romantic and the hubs. I think we should ALL go crash the romantic’s couch/floor/wherever is available in their flat. We’d have so much fun! London was my first international trip. It holds a very important place in my heart. Of course it might have something to do with proposing to my now wife of 15 years on the bank of the River Thames across from Big Ben on that first international trip back in 98.